A slick believed to be bunker fuel oil in between freighters in Vancouver harbour. Apr. 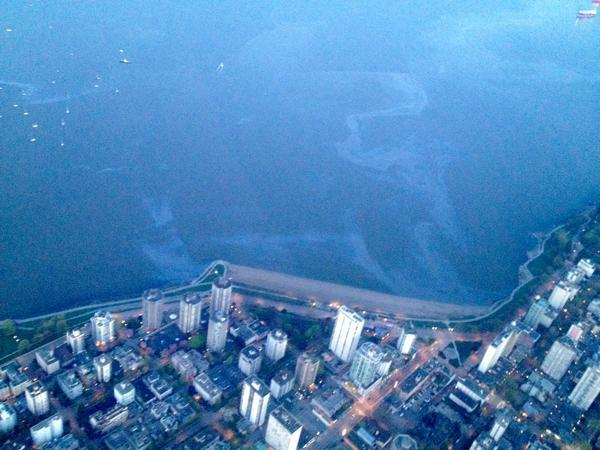 9, 2015 4:00 p.m.
A suspected spill of bunker fuel oil from a grain freighter in English Bay has triggered an ongoing cleanup, as well as criticism of the effectiveness of the emergency response. Port Metro Vancouver spokesman John Parker-Jervis said the port received reports around 5 p.m. Wednesday of oil in the water and dispatched a boat that confirmed it. But there was no immediate move by the Canadian Coast Guard – the lead response agency – to call in the Western Canada Marine Response Corp. (WCMRC) to deploy booms to contain the spilled fuel. That didn’t begin to happen until 8 p.m. Wednesday evening, and it was six hours before containment booms were in place around the suspect vessel, the grain freighter Marathassa. Initial estimates from the Coast Guard peg the spill at 2,800 litres, with an estimated 80 oer cent of it recovered as of Friday morning. The Marathassa initially denied it was the source but has been found responsible and is expected to be liable for cleanup costs. The new vessel was on its maiden voyage and is believed to have malfunctioned. Despite the containment efforts, large slicks extended to shore, where cleanup volunteers were finding tar balls and oiled seaweed. A Vancouver Aquarium team was gauging damage to marine life. Crews also moved to intercept oil that was migrating around Stanley Park towards the North Shore and Lions Gate Bridge as of Thursday afternoon, but some oil reached Sandy Cove in West Vancouver. The City of Vancouver issued warnings early Thursday that the spilled fuel oil is toxic and people on the water or beaches should avoid it. City officials weren’t notified for 13 hours until 6 a.m. Thursday and expressed concern about the delay. Coast Guard regional director Capt. Roger Girouard said the shoreline cleanup phase will involve working with other agencies to weigh the benefit of cleaning soiled intertidal areas against the damage it may cause. Girouard said he wouldn’t call the spill “catastrophic” but Parker-Jervis said an incident of this type is “very rare” in Vancouver harbour. Unlike oil tankers that carry crude oil from the Trans Mountain pipeline in Burnaby for export, every freighter in the harbour carries bunker oil as fuel. Opponents of Kinder Morgan’s pipeline expansion plan, which would nearly triple Trans Mountain capacity and send out hundreds of extra oil tankers a year carrying oil sands bitumen, called the English Bay incident a reminder of a potential future nightmare scenario and predicted a spill of oil sands bitumen would be far worse. The incident also reignited criticism of the federal government’s decision to close the Kitsilano Coast Guard station, which its former commander said could have provided a much faster and more effective response. Two of the worst spills to affect southern B.C. shorelines did not come from oil tankers or an anchored freighter, but smaller vessels that ran into trouble at sea. The fuel barge Nestucca was punctured by the tug towing it in 1988 and spilled 5,500 barrels (874,000 litres) of bunker fuel oil off Washington’s west coast. Tens of thousands of oiled sea birds died from northern Oregon to Vancouver Island. And In 1991, the fish processor Tenyo Maru sank in U.S. side of Juan de Fuca Strait with 14,000 barrels (2.2 million litres) of various oils aboard after it collided with a bulk carrier. Oil fouled shores from western Vancouver Island to Oregon. Energy consultant John Hunter said the bunker C oil that is typically carried as fuel by everything from freighters to cruise ships is thick, viscous and hard to clean up. He said it’s too early to say how the oil escaped. Aerial view of slick. Photo courtesy Chad Dey / News 1130 Radio.